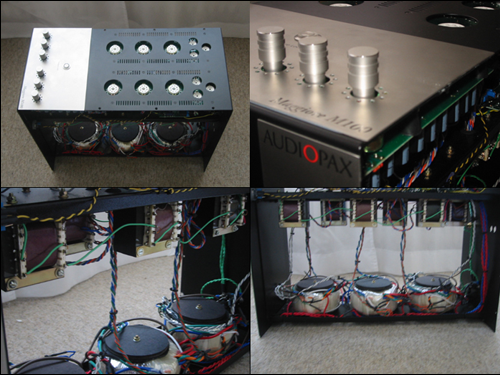 In March 2003 and our very first year of publishing, I had reviewed the Audiopax Model 88 monos to subsequently acquire a pair for personal use. Many years later we left the US for Cyprus in the Mediterranean and I lost touch with the Brazilian designer. A few years thereafter we relocated to Switzerland. At the HighEnd Munich show of 2011, I ran into Eduardo de Lima and his then brand-new Maggiore 100 monos. The time had come to catch up with one of the more original thinkers of our industry. 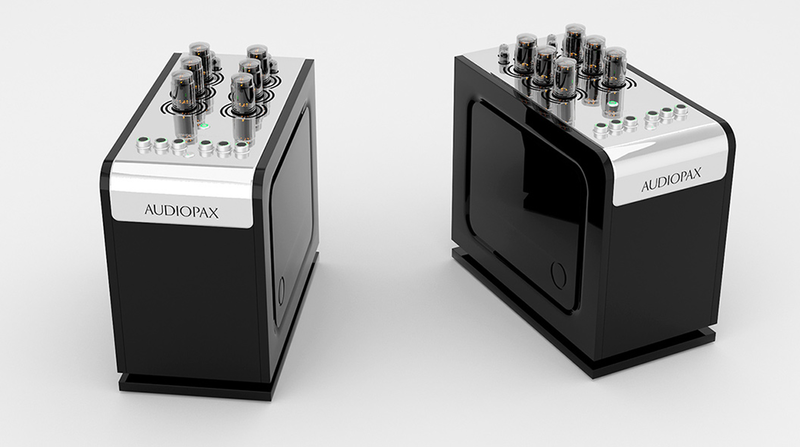 As I'd put it in my mini notes on the show, "Audiopax's Maggiore 100 was the return of a legend by scaling up the Model 88 technology to output 100 watts in class A1 with a series/parallel connection of six discrete single-ended amplifiers in one chassis. Four of the six output transformers are strategically dissimilar to optimize Eduardo de Lima's unique TimbreLock concept. Because these amps and the matching preamp are now built in Switzerland to which Eduardo shall shortly return to oversee first production, he has kindly agreed to visit me for an in-depth interview about his new amplifiers and perhaps even a formal review." Conducting the interview in July 2011 in our prior Villeneuve digs, I had no idea that Eduardo soon thereafter would pass away. A few years went by until his son Lucas de Lima and prior business partner Silvio Pereira had regained global trust that the company would continue unbroken by this grave loss. In March 2015, their dealer Geoffrey of Monaco's Soundgalleries checked in. 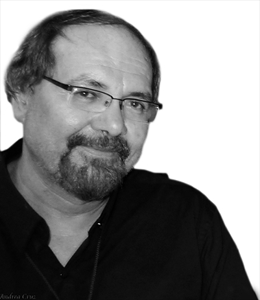 He wrote that he and Silvio would host an Audiopax room at the Munich HighEnd 2015 show. Would I be interested to review their demonstrators post show before they'd return to their freehold domicile in downtown Vevey right below our digs on the mountain? To kick off this review four years later, let's rerun the interview of July 2011. "This whole Maggiore project started this year in January. At CES 2011 we had shown the new 3rd-gen Model 88 monos we call A3 and our new top-range Arpeggione loudspeakers. Our Norwegian importer Per Bendiksen walked into the room—I was so involved that it took me a few seconds to recognize him—and stated with a grin that "I only came to the CES to see you. I wasn’t going to come at all but then I heard you’d attend. So I flew in too. 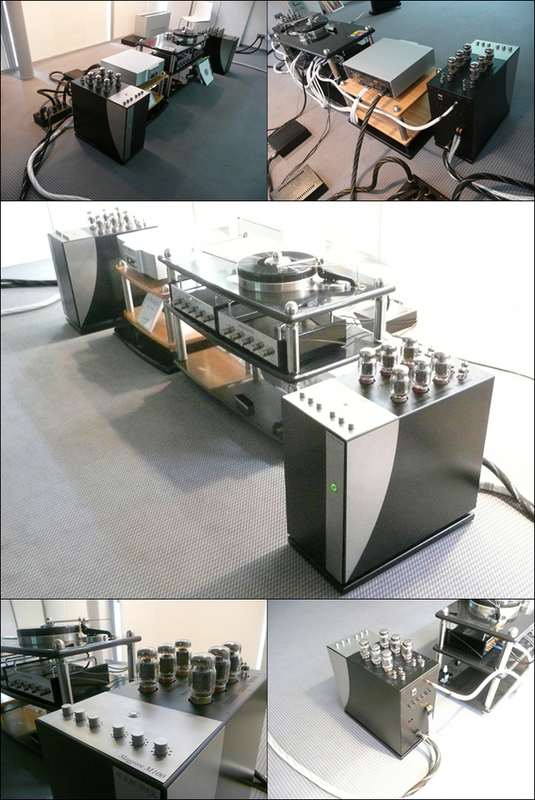 At the upcoming Munich show we will have a room with our Audiostone turntable. We’d like for you to participate." On the spur of the moment I agreed. That’s what really started it all. I began talking with Per. His friend Svein, the owner of Audiostone, designs the turntable. Collaborating over an 8-month period with a very well-known Swiss turntable and tone arm manufacturer who also consults for other companies, Svein decided to have his Audiostone deck fabricated in Switzerland. Eduardo with Swiss prototypes in Villeneuve. "This got me to thinking. Perhaps I had to do the same not for our existing Model 88 but the new amps I’d been developing conceptually but which weren’t ready? They were as yet nothing but lots of experimental data and ideas. So for February we scheduled a meeting in Switzerland. Our contact there does a lot of specialized work in precision mechanics and surface finishing. He actually came from the Swiss watch industry. He consults for many other audio companies. He is very well connected with electronic subcontractors to offer turn-key services. He is also exceptionally versatile and bright. We sat down together and designed the whole intricate chassis for what would become the Maggiore 100. Between CES and this February meeting, I returned to Brazil to finally design a working prototype of an amplifier which until then had only existed as a concept in my mind. Three weeks later I had what looked like a squat stove. When I listened to it I was shocked. It was a lot better than expected. I was completely taken aback. For years I had worked on these ideas and how to adapt tube curves to more closely track how I thought they would improve over my existing designs. Swiss monos above; Munich HighEnd 2011 at right. "I started the first listening session at 18.00 that evening. As you might imagine, after so many years, one gets a bit blasé. You finish something and it’s what you expected. You listen for three or four hours. The next day you begin to tie up loose ends and it's business as usual. But here I was at 4:00 in the morning still listening. This truly shocked me. It was much better than I had anticipated. Now I had to go back and try to understand why. (Laughs). It’s good when you have to modify some of your own ideas and theories because they worked too well, not because they didn’t work. (Giggles happily.) That’s rare of course. Usually you have to revise your theories because they worked less well than predicted; or not at all. So that was a unique event. It's something that doesn’t happen too often in a lifetime. "When I came to Switzerland in February, I already knew that I had something very special. So we wasted no time. We sat down to design the case work. It was to be very different from my stove but I did want to retain some semblance to the Model 88s which had put Audiopax on the map. I simply wanted a modern 'inspired-by' makeover. And I think we got that. This collaboration evolved into quite an expensive project which we now had to finance. "There were some associates in Brazil who'd made upfront promises. But I’ll get to that. In about a week we had all the necessary drawings done to finalize agreements, budget and the core design so I could go back to Brazil whilst he could detail out the various parts and sub assemblies to actually produce the enclosures. There’s a lot of machining involved for coupling bits, various supports for the tubes and transformers, wire routing channels, braces and such to really isolate vibrations. There are Teflon bushings and other specialized parts which I could never get done in Brazil. This had me very excited. I could finally go all out. I could finally implement my circuitry with fully optimized mechanics and finish—no concessions to the usual limitations—and do it in the country perhaps most famous for precision work in the world. "In Brazil you don’t have access to most of this. Whilst we do have the necessary equipment, operators and factories, you have to order thousands. "These guys will never pay any attention to someone small like me. They work for Big Petrol and other major corporate players. The gulf in size and numbers is about 1:1'000. There’s no way you can get these things accomplished as long as you occupy a scale of operations like Audiopax does. So it was unbelievably liberating to finally work with someone where these complications and restrictions wouldn't factor. Our collaboration evolved very quickly. Over about a month we communicated nearly daily between Brazil and Switzerland to go over the physical design with shared computer screens. For me this was a very productive and satisfying period. Simultaneously I decided to build up 5 pairs of pre-production prototypes in Brazil. Those would mirror the size and shape of what took place in Switzerland but with fully functioning guts. I had to work out practical interference issues between transformers, the best internal positioning of various parts and get ahead with the things I needed to do like laying out the circuit boards. "By now we were in March. The Munich show would be in May. This meant working overtime. At first we thought we could show final Swiss production units but that proved flatly unrealistic. By mid April however, we had built up our targeted five Brazilian pairs. My chassis fabricator was literally working night shifts and weekends to make it happen. Now it transpired that a very wealthy individual whom I know very well and who had sponsored this project from the very beginning had unexpected personal issues as things progressed. He had to pull out. Of course I understood perfectly. But now I was faced with how else to satisfy all the commitments I’d already undertaken. We quickly put our five pairs of amps in the car and visited audiophiles all over Brazil who were rich enough to afford anything in hifi that takes their fancy and who in general are deeply invested in and passionate about this hobby.